Hyundai's exports have fallen 50 percent so far this month amid protracted strikes that are holding up deliveries. The strikes are a quasi-annual ritual, but this year the carmaker's labor union has downed tools 24 times since July, resulting in US$1.3 billion in lost exports compared to last year (US$1=W1,124). On top of that Hyundai is embroiled in a costly recall of engines used in the flagship Sonata sedan. The company has agreed with owners in the U.S. to provide free repairs of 880,000 cars and extend warranty periods. On Wednesday, Hyundai promised the same compensation to Sonata owners in Korea. But the company has now managed to pacify striking workers by reaching a tentative agreement over wages. As workers downed tools, exports took a direct hit. Hyundai has been inundated with queries from overseas dealers whether it will be able to deliver cars on time. The company admits that it has enough inventory to last two to three months, but eventually it will run out. The delays are affecting Korea's total export figures because cars account for eight percent of Korea's total exports and Hyundai is responsible for 80 percent of that amount. Korea's overall car exports have dropped 52 percent so far this month compared to the same period of 2015 and overall exports have dropped 18 percent. A production line in a Hyundai plant in Ulsan sits idle due to a strike on Sept. 23, 2016. Hyundai and affiliate Kia have not built a new production plant in Korea for 20 years, the last being the one in Asan, South Chungcheong Province in 1996 that is capable of rolling out 300,000 vehicles a year. But Hyundai built 17 plants in nine other countries over that period capable of rolling out a total of 5.1 million vehicles a year. Overseas plants can now make 2 million more vehicles a year than domestic plants. Hyundai alone created around 46,000 jobs overseas and Kia 16,000 as of the end of 2015. 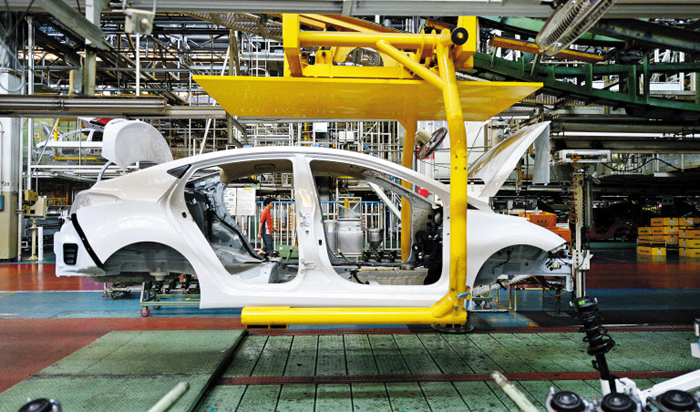 The numbers mean Korea has fallen from fifth to sixth place in automobile production volume and been overtaken by India. And it has been overtaken by Mexico as the world's No. 3 car exporter behind Germany and Japan. "The domestic automobile industry is losing its luster due to limited sales and militant labor unions," said Kim Yong-geun of the Korea Automobile Manufacturers Association. The engine quality scandal is making things worse. U.S. owners of 2011-2014 Sonata sedans with 2.0 and 2.4-liter Theta engines sued Hyundai over engine stoppages or noise and accused Hyundai of failing to inform them of these problems. Hyundai has reached a settlement with 885,000 Sonata owners in the U.S. by agreeing to provide free inspections and repairs, extend their warranty and reimburse them for repair costs incurred so far, and the same package will be offered to Sonata owners in Korea. Hyundai insists that the problems plagued only models manufactured in the U.S. "The reason why we extended the warranty period on domestically manufactured Sonatas with the Theta II engine is that we're confident that no defects exist," a Hyundai spokesman said. But the decision has only increased suspicions among owners here. The Ministry of Land, Infrastructure and Transport, meanwhile, accuses Hyundai of trying to cover up alleged air bag defects in some models and turned to prosecutors to look into the allegations, while also conducting its own probe into the engine problems. Lee Nam-seok, business management professor at Chungang University said, "The focus has to be on quality improvements and regaining consumer trust rather than on volume growth."